Millennials (those age 18–34) may need to upgrade their mobile data plans to support some of their favorite activities on their smartphones. In the last year alone (Q2 2015 to Q2 2016), the number of millennials using their smartphones to shop online has increased 10 points to 59 percent. They are also video calling more (up 14 points to 56 percent) and streaming videos more (up 9 points to 40 percent). But they are not the only ones – all adult smartphone users have nearly tripled the amount of video data they consumed monthly in the last year. These insights and more came out of the latest report from NPD Connected Intelligence, which analyzes consumer use of smartphones, connected TVs and tablets and identifies which content resonates on each device. The market research company’s semi-annual “Application & Convergence Report” is based on responses from 5,110 adult U.S. consumers “from diverse regions and demographical backgrounds,” according to a prepared statement. Viewing files from the computer (about 30 percent). 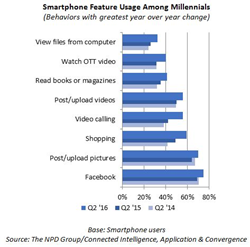 In fact, cellular data video consumption is in high demand for not only millennials, but all smartphone users. NPD Connected Intelligence’s latest “Data Consumption Report,” which details monthly data use, is based on information from more than 1,500 consumers with Android and iOS smartphones that utilize the company’s SmartMeter panel. Analysts saw a shift in usage behavior across all smartphone users, with video data consumption increasing 130 percent over the last year. When factoring in smartphone video use on WiFi networks, the consumption increases to 192 percent – from 5GB of data to 15GB per month per user. NPD Connected Intelligence predicts that as video data consumption continues to grow, so too will zero-rated data plans that enable users to stream video content without using up their data. To request the reports or to learn more, visit the NPD Connected Intelligence site.